The Garmin T5 Mini GPS Collar is the extra tracking only collar that will work with Alpha 100 and Astro 430 dog tracking handheld. This small dog GPS tracking collar will suits dogs from 7kg in weight. The T5 mini collar has up to 6 km range. And it is fully waterproof IPX7 rating (up to 10 metres under water), rechargeable with 4 hours fast charge (up to 30 hours per full charge). The Garmin T5 mini collar has built in Standard GPS satellite receiver as well as the GLONASS satellite receiver. The GLONASS is the Russian Navigation Satellite System which has 24 orbital satellites. 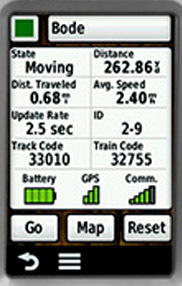 It is the second alternative navigational system in operation with GPS. It means this Garmin T5 mini collar is able to receive 24 more satellite signals than other GPS dog tracking collars. It is very unlikely that this T5 mini collar will lose the signal. The GLONASS helps you to locate the dog much quicker and has much better signal strength even in heavy cover.